The best moments in Walt Disney Pictures “Alice Through the Looking Glass” can be counted on two fingers – one is the beautifully tailored costumes by Oscar-winner Colleen Atwood and the other can be found during the end credits, when a text appears on-screen dedicating the film to the late great Alan Rickman. 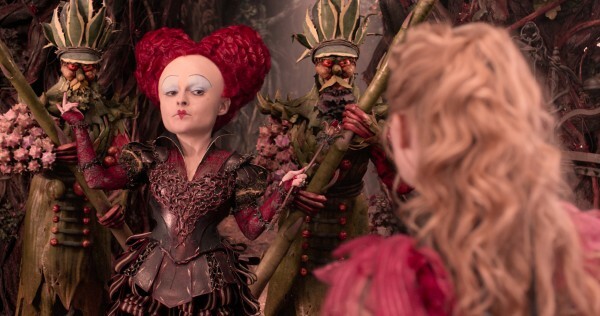 That’s it though for this forgettable and needless sequel to Tim Burton’s annoying CGI leaden “Alice in Wonderland“, the 2010 surprise blockbuster hit (that raked in over a billion globally) that kicked off Disney’s live-action adaptation of their classic animated features craze. A sequel to this may have been inevitable, but clearly that doesn’t mean it’ll work (or that anyone was clamoring for one). Burton takes on a producer role here, while “The Muppets” director James Bobin takes the wheel, which doesn’t mean the movie looks that much different since it was hard to tell if Burton left any identifiable mark on the look and feel of the first movie. Anyway, the director’s job on a movie like this is to imitate the previous director and deliver a product. That’s what big studios think viewers want. I always say, if you’re going to do a sequel, make it different or new; or at the very least, compelling in and of itself – none of that can be found in “Looking Glass”. The movie has an indecipherable opening on the high seas, where we find Alice Kingsleigh (Mia Wasikowska) capably manning a ship called Wonder, just like her father once did. We try to watch as her resourcefulness outsmarts three pursuing ships sailing from China (it’s not clear why they’re pursuing except to show viewers an adventure), but the combination of a rainy night scene and good amount of CGI makes it difficult to follow. It sets the stage for the rest of the viewing experience. 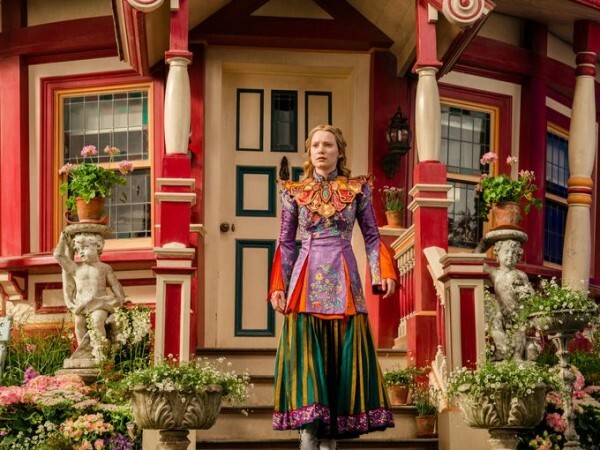 When Alice returns to London after being absent for years, she and her mother (Lindsay Duncan) are told by Alice’s resentful ex-fiance, Hamish (Leo Bill), who has since taken over her father’s company, that she must sign over her ship in exchange for her mother keeping their home and take a clerk job. 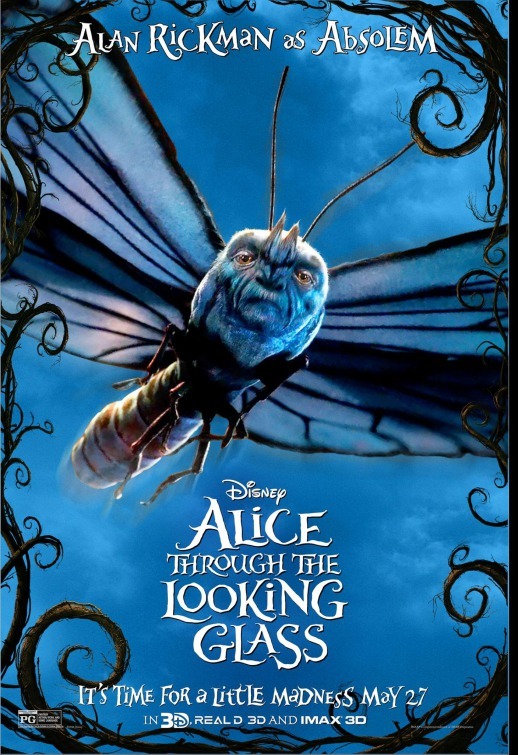 Frustrated, Alice steams off and winds up following a blue butterfly she recognizes as Absolem (Rickman) into a dining room, where the lepidoptera flitters through a large mirror. Worried that Hamish and his lawyers will find her, Alice’s curiouser and curiouser curiosity finds her following Absolem through the titular magic glass. Alice finds she has returned to Underland, where she reunites with old friends such as Cheshire Cat (Stephen Fry), Thackery Earwicket the March Hare (Paul Whitehouse), Nivens McTwisp the White Rabbit (Michael Sheen), Mallymkun the Doormouse (Barbara Windsor), Bayard the Bloodhound (Timothy Spall) and Tweedle Dee and Tweedle Dum (Matt Lucas) and, of course, the Mirana the White Queen (Anne Hathaway) – all of whom show great concern for the current state of their friend, the Mad Hatter (Johnny Depp), who has been in a near-death state of depression since recently learning his family is actually alive, not killed by the jabberwocky which he thought for so long. 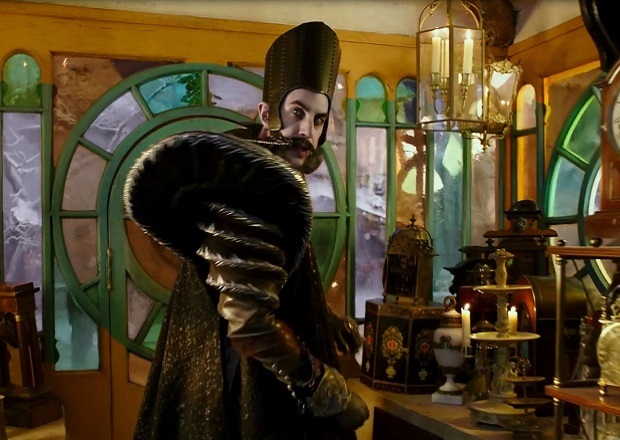 The White Queen convinces Alice that the best way to help her friend is to give the half-mechanical manager of the time continuum, Time (Sacha Baron Cohen), a visit and request the use of his chronosphere, which can assist an individual in traveling through time. Using that device, Alice will be able to go back in time and prevent the Hatter’s family from dying. She unexpectedly learns of another scenario related to their death, involving Iracebeth the Red Queen (Helena Bonham Carter) and her long-standing resentment toward her sister, Mirana, which further complicates Alice’s quest to save Hatter. 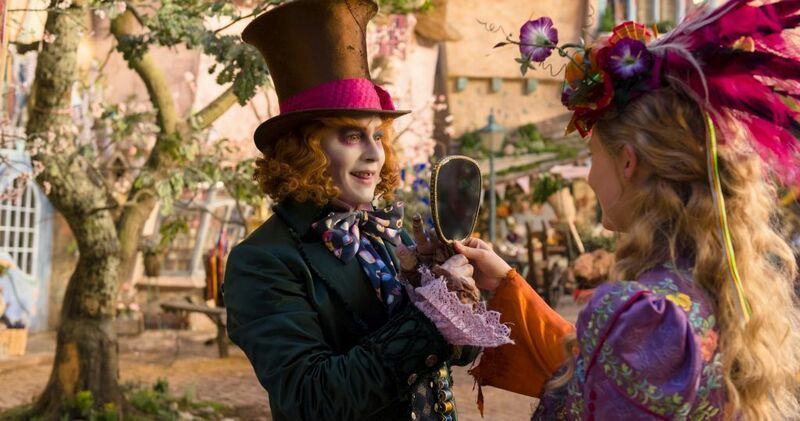 Director James Bobin has proven his ability to deliver lighthearted, clever family entertainment with “The Muppets” and “Muppets Most Wanted“, so a trip through the looking glass seems like it would be a nice fit. But it’s hard to tell where his mark is in “Looking Glass” since he’s just picking up the aesthetic that came before it. In the previous film, I found myself utterly annoyed with the landscape of Underland. Sure, it has colorful geography and a color palette that looks like the designers through liquified Skittles at it, but there’s also a feeling of phoniness as well, due to its heavily reliance on CGI, which totally takes us out of the movie. The big turnoff for me in Burton’s “Alice” though was Johnny Depp, I couldn’t stand his garish look – a cross between Carrot Top dressed like Boy George as a mime – nor could I handle his unfunny acting, which seemed to be a mash-up of Capt. Jack Sparrow and Willy Wonka. I couldn’t stand it then and I couldn’t stand it now. I also didn’t care for Bonham Carter’s Red Queen, but she’s a little easier to handle here since we learn more of her back story that indicates why she’s such a volatile unnerving character. I considered all this going into “Looking Glass”, but I still had to see if it’d be just as wretched as the first one, primarily because I like Wasikowska quite a bit. Her role as Alice doesn’t give her a whole lot to do, but she commits to it, injecting just as much energy and talent as any other role she’s taken. When this movie is focused on Alice, especially during her story outside of Underland, it’s actually quite interesting, but seeing how most of the movie is expectedly placed in the fantasy world of tea parties and royalty outbursts, Wasikowska’s Alice gets lost in the mix, simply going from one location to the next. In fact, much of the action in “Looking Glass” reminded me of the worst parts of Peter Jacksons three “Hobbit” movies, which often finds the camera pulling back and watching our diminutive characters race from point A to point B, as if viewers were watching someone play a video game over and over again, with no real grasp of peril or connection to the drama of the situation. That’s what we have here and then some. The new environment that Alice visits is Time’s castle, which feels like one gigantic steam punk amusement park ride, not a location that feels like an actual place, unfortunately. In it we find Time’s silent minions, called Seconds, who creatively splice together to form themselves into Minutes and eventually Hours. Unfortunately, those characters feel straight out of a video game as well, or more like a game you might find on your phone. It doesn’t help matters that the overrated Sacha Baron Cohen gives his character a Werner Herzog accent, but at least he fits in with all the other annoying characters that inhabit Underland. It’s frustrating because Underland should be populated with whimsical and loony characters, not ones that annoy or unnerve – or gasp, bore you. But, that’s what we had in Burton’s movie and that’s what we have here. This time around, the CGI used for the characters feels even more noticeable and the locations feel either claustrophobic or too busy to comprehend. The busy visual effects overwhelm Linda Wolverton’s (a longtime Disney screenwriter) underwhelming story. Why exactly does Alice call Hatter her “very best friend”? She just spent three years at sea – when did she last speak with her very best friend? And what kind of friendship can she have with a guy who speaks in fortune cookie gibberish? If their friendship is supposed to be the at the heart of the main plot, the movie does a terrible job establishing it. The Mad Hatter is relinquished to yet another movie character with daddy issues (his father is played by an Rhys Ifans) and Alice is left to run from time to time (literally) in her stolen gyro contraption. Neither the visuals or the story offers anything for the viewer to connect with or to be entertained by – in fact, I dozed off a couple times. I really hope this sensory overloaded movie crashes at the box office. It’s visually assaulting and painfully boring. Oh sure, Disney will continue to make live-action remakes of their classic animated features, but I hope their failure here will find them heeding a yellow light instead of speeding through one to get to the next sequel.